The team behind the book Once in a Lifetime: City-building after Disaster in Christchurch is pleased to present the second edition of Talking Heads, a series of talks that explore the current state of play in Christchurch and expand upon some of the themes and issues discussed in Once in a Lifetime. Join us out east for a discussion about housing: is there a housing crisis? With our panel participants we hope to open up the conversation to look at some of the many issues that feed into housing: affordability, health and wellbeing, quality of housing and so on. Barnaby Bennett, one of the book’s editors and architecture PhD student, hosts this event and will field questions from the floor. Anna Langley is on the board of Tenants Protection Association and is a facilitator of a community hub which delas with social issues . Dr Alistair Humphrey is the Canterbury Medical Officer of Health and Garry Moore is a former mayor and runs the not-for profit Your Home, which buys houses in the east and moves them to sections elsewhere in Canterbury in an attempt to provide affordable housing to lower income families. Copies of Once in a Lifetime: City-building after Disaster in Christchurch will be available for $40. Every Friday dozens of people head down to Latimer Square to get a hot meal from volunteers. These are many of the vulnerably housed people who call the streets of the CBD home. Many of them will stay in some of the shelters and church-led accommodation to the east of Madras St. Pre-quake, there were lots of properties that catered for these people. I remember that the front porch of the Grumpy Mole was often a prime spot for rough sleepers. Post-quake, it’s not so easy. Following the cold snap of the last few days, the City Mission has put a call out for blankets because their night shelters are full to capacity. If you can help them out with a spare blanket or some cash, please do. And if you’re in a position of power, please stop pretending these people don’t exist in our city. They do. Any discussion about the residential future of the central city which fails to acknowledge the existence of people in poverty or people without a regular abode will only serve to reinforce these problems. * I’m not for a minute saying that only brown people are vulnerably housed. There are all sorts of races down at the food van when I go by it on Friday evening, but I don’t stop to take pictures or count ethnicities. Affordable? You can’t afford not to! I was on the plane to Auckland on Saturday, and instead of reading more of my boring book I flicked back through a series of older newspaper articles that I’ve meant to read for a while. One was this piece from the head of Warren and Mahoney, Peter Marshall. He is talking about housing in the eastern frame, and is pretty boosterish about it. He says that we should be building affordable housing – great! Christchurch has apartments now on the west side between the central city and Hagley Park but they are fairly high end. THIS GUY THINKS THAT $600,000 IS AN AFFORDABLE HOUSE. JUST THINK ABOUT THAT FOR A BIT. Are you still digesting that – I’ll give you another moment. Whereas the average house price before the quakes had been around $310,000, an average new home including land would now cost between $450,000 and $550,000. If you take the mid-point of that latter bracket – $500,000 – then the average house price has gone up $190,000 in 5 years. That is pretty much 10% a year, each year since the quakes. If people’s wages had been going up 10% a year, I think we’d know about it. They haven’t. Saying that things aren’t as bad as they are in the Auckland housing market is irrelevant; here we had a major disaster, and the government has a duty of care to ensure that the people of Christchurch suffer as little as possible. Despite repeated warnings of a housing crisis, National refuses to accept that there is anything wrong. And why would they? They are the party of property prices; they returned a stunning result in Christchurch at the last election, and I reckon that is in large part due to many, many people feeling very good about the increasing value of their property portfolio. That this dude can say that $600,000 – twice what the average house cost just five years ago – is an “affordable” home with a straight face shows how totally broken the market is. No-one is going to provide affordable housing that is actually affordable for the people who need it. In the short term, this will serve the government and it’s allies; the head of the CCDU Warwick Isaacs is about to leave so he can join Stonewood Homes, a builder of cookie-cutter landfill subdivisions in which half the houses failed their inspections. In the long term, Christchurch will become a city that is only affordable for the homogenous, white middle-class that CERA depicts in their advertising, whilst the poor, the working class, the migrants, the students and the people who generally make cities interesting places to live give up on the White Man’s Dream and head for greener pastures. On August 7, the Prime Minister was in town to announce the convention centre plans. This was done in a special marquee that was erected on the site, and to a very select group of delegates. I used an OIA to ask CERA how much hosting this shin-dig cost; almost $16,000. This was an event for around 90 people; this works out at around $170 a head (on the taxpayer). I’m sure Key and Brownlee thought that the convention centre announcement would lead the news. Instead, their trip to Christchurch was derailed by the real hardship that their government is responsible for, as Paulette Barr approached the PM directly with her case. On the PM’s trip to Barrington Mall last week, he was again approached by a resident at wit’s end. This pattern will repeat each time he visits the city until he does something to address the growing divide between those who have done ok through the quakes, and those who are still battling on a daily basis. Whilst Key and Brownlee eat canapés, there are people in this city living under canopies. Mr Brownlee needs to explain to the public of Ilam and Christchurch how he can justify spending almost $16,000 on a swanky party for him, the PM and a few exclusive guests, to announce a facility that very few residents of this city will ever have a need to use. If Mr Brownlee spent more time in the electorate he represents, he’d know that his constituents don’t care about convention centres: they want their houses fixed, their EQC claims sorted, their rents to stop increasing at double digit rates. Last week, Paulette Barr saw the Prime Minister in Riccarton mall and bravely approached him with her story. It was a bleak story, and got plenty of media attention – front page of the Press, story on Campbell Live. A week later, some good news – Barr’s claim has now been “fast-tracked”, and Christchurch Central MP Nicky Wagner has become involved. While I am happy for Barr – no-one should be going through these situations almost 4 years after the quakes – this story actually makes me more upset. It’s shouldn’t be like this. You shouldn’t have to rely on a chance encounter with the Prime Minister to get any movement on your claim. There are thousands of cases like this in Christchurch right now – how can we get them all “fast-tracked”? On the same day that we get the happy resolution story, we also have this – a homeowner living in a 3 degree house after repeatedly being told different things by EQC. What we need in Christchurch is an admission the EQC and insurance process for fixing houses is fundamentally broken. We need the Minister of EQC, Gerry Brownlee, to answer questions as to why it has got to this point. Instead of merely patching up cases when they reach the media, the whole culture of these organisations needs to change. Their role is to help people. They shouldn’t have to be guilted into doing so by the media. I have a guest post over at the Standard right now – Walking through the wrong door is the least of Gerry’s problems. Jump over there and read it in full! What we need in Christchurch is more houses, now. Affordable, well-designed, well-insulated houses. Lots of them. This is why Labour’s Kiwibuild scheme will roll out 10,000 houses in Christchurch in the first 4 years. People have waited too long for the invisible hand. Labour believes that the government has a strong role to play in alleviating the considerable stresses in the Christchurch housing market. 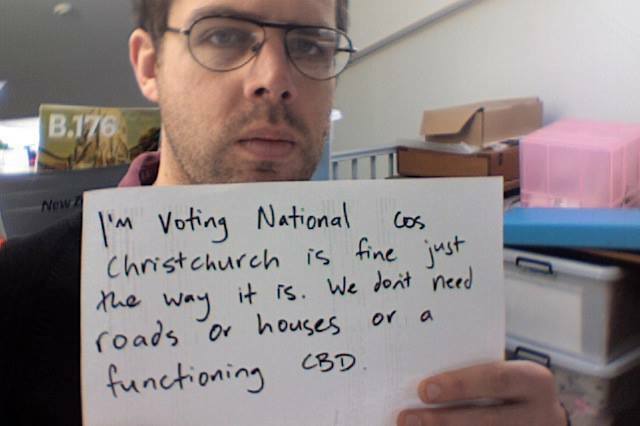 Not only do National deny that there is a housing crisis in Christchurch, they have left the rebuild in the hands of a man who demonstrated at the airport last Thursday a level of arrogance that suggests he is completely out of touch with the people he is meant to be representing. While the PM may have chosen not to accept his resignation, the people of Ilam don’t have to: they have the chance to show Gerry the exit door on the 20th of September by voting Labour and voting for James Macbeth Dann. So the World Cup has started! I jumped out of bed for the first time in a while, put on my All Whites shirt (never stop believing) and settled in for what was a pretty good game. Sure, dodgy decisions, bad keeping, but there was an comedy own goal from Brazil’s pantomime villain, and that fancy spray paint. Aside from when New Zealand flukes an appearance, I support France. I don’t really know why. They’re either amazing, or amazingly terrible. 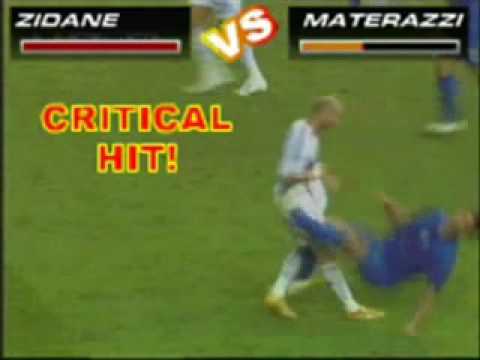 Their implosion in 2010 was almost as good as Zidane’s fantastic headbutt in 2006. One of the leaders of the 2010 mutiny, wannabe Bond villain Franck Ribery, has been ruled out with injury, which is a massive plus. The Ribery-less Les Bleus demolished Jamaica 8-0 earlier in the week, and looked much better without him. I don’t think they will win it, but maybe leave after a comical on-field dustup between team mates in the quarter final. Now let’s look at Billye Jean Rangihuna’s French double, Jeanne-Billois Roquefort. Her rent could only be increased once a year and the raise would be capped to a government-issued index (usually under 3 per cent) based on inflation. At the end of her three-year rental contract, Roquefort’s landlord could hike the rent more, but only if it was significantly undervalued compared to market rates. To do so, they would have to give six months’ notice. Even then Roquefort could refuse the increase, in which case the landlord would have to go to a conciliation commission. The French system arguably puts lots of pressure on landlords. But tenants are usually the more vulnerable party in the tenancy relationship and therefore need protection. A stunning finding of the report is that no one actually knows who holds the French debt. To finance its debt, the French state, like any other state, issues bonds, which are bought by a set of authorised banks. These banks then sell the bonds on the global financial markets. Who owns these titles is one of the world’s best kept secrets. The state pays interests to the holders, so technically it could know who owns them. Yet a legally organised ignorance forbids the disclosure of the identity of the bond holders. Hence, the audit on the debt concludes, some 60% of the French public debt is illegitimate. The nascent global movement for debt audits may well contain the seeds of a new internationalism – an internationalism for today – in the working classes throughout the world. This is, among other things, a consequence of financialisation. Thus debt audits might provide a fertile ground for renewed forms of international mobilisations and solidarity. The problem is similar to that with National’s “beneficiaries to Christchurch” policy: where are these people going to be housed? Increasing skilled migration to fix a labour shortage will be key to ensuring that the recovery finally starts to ramp up, however we can’t forget the need to house the people who are already here, and have been doing it hard for the last 3 and a half years. Adding a large number of skilled migrants to the mix is going to place additional stress on a property market that isn’t coping with the existing demand. So while there is a clear need to attract skilled people, we still have a responsibility as a society to make sure that we are looking after those people who are still here and have been through so much already. We also have a responsibility to house the migrants who have already come to work in the city – and that doesn’t mean putting them in a Portacom, a caravan or a shed. Labour’s response won’t leave people to the whims of the market; our most vulnerable people need a helping hand, not the invisible hand. Last week’s budget offered little for Christchurch. In fact, you could argue that it took from the city to enable a wafer-thin surplus for Key to crow about. Well, there was one tangible policy relating to Christchurch; paying beneficiaries to come to the city if they get a job. It was widely lampooned when it was announced, and rightly so. A story from the Sunday Star Times yesterday further confirms the futility of this policy. Cecile Meier reports that Fletchers EQR, one of the biggest employers in the rebuild, is telling contractors to look for work elsewhere. 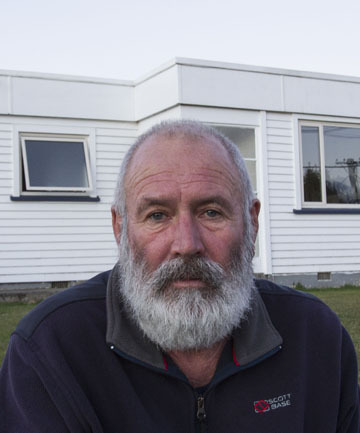 Two contractors, speaking anonymously, said Fletcher EQR, which is contracted to manage repairs, last week apologised to a group of its preferred contractors in Christchurch because it would not be able to give them as much work as promised. One of them, who has worked for Fletcher since the start of the repair programme, said the announcement came as a surprise. “They told us last week that they couldn’t guarantee us work because EQC had not given them the jobs,” he said, speaking anonymously. 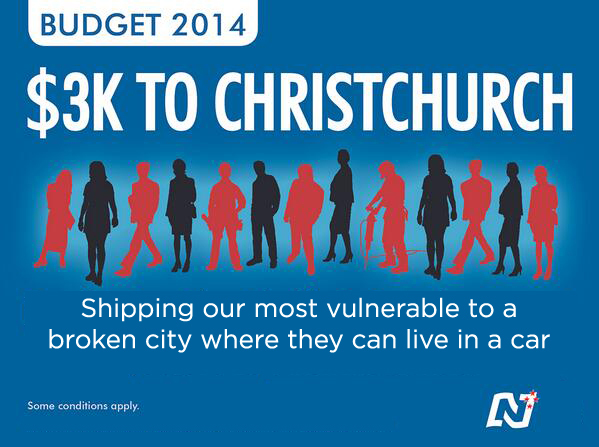 So the “come to Christchurch, there are heaps of jobs” bit has fallen flat, but where are these people going to live? CERA figures showing that rents in Christchurch will soon match those in Auckland confirm that there is indeed a housing crisis in the city, and that the government’s “hands-off” policy is leaving our most vulnerable people to suffer in a distorted market. Projections in a CERA report show that by January 2015, the average rent will be around $460 – on par with what you might expect in Auckland. This isn’t just an issue limited to the suburbs which sustained the most significant earthquake damage. In fact, data from MoBIE shows that the annual rent increase in the suburb of Aorangi in the Ilam electorate was a staggering 39.1%. Despite these clear signals that the housing market in Christchurch is indeed in a crisis, the government continues to act as though everything is fine. Just this morning, Key was on Morning Report denying that there is any crisis. Meanwhile, projections from Housing New Zealand, released to Labour under the Official Information Act, show that over the next ten years, the government plans to sell off more than 500 state homes in the city. We put a great crew of doorknockers out in the electorate at the weekend, and the single biggest issue was housing. This policy, and the PM joining Gerry Brownlee and Nick Smith in denying a housing crisis in the city shows just how out of touch they are with what is going on down here. The housing situation in Christchurch was “absolutely bloody dire”, said Tenants Protection Association Christchurch manager Helen Gatonyi. That’s just one point of view though, right? Surely the Government is doing everything it can? Just 8 per cent of the Crown agency’s broken city housing stock has been repaired, with more than 4500 still requiring work. Despite that figure, which look like an absolute failure, Housing New Zealand assures that they are “on target“. So by Mid-October – which I think we can assume is “about now”, they were expecting to have done 1336 repairs. They have done 254. Even if you include the 150 that are in progress, that’s less than a third of what they were projecting to have done by now. How can they say that they are “on target”, when they have failed, dismally, to meet their own targets? How is anyone meant to have any faith that they will hit their next target of 2000 houses by mid-February 2014? Labour’s housing spokesperson Phil Twyford said: “I would say it’s a heroic assumption that they are on track.” There’s not a huge amount of heroism on display around here at the moment.